IMPACT SAFE-T ARMOR'SPATENTED IMPACT DECELERATION CONTROL TECHNOLOGYHERES HOW IT WORKS! 1. IMPACT ENERGY (1) is transmitted through the expanding pouch outer cover (4) directly onto the flexible impact diffuser (2). 2. FLEXIBLE IMPACT DIFFUSER (2) distributes the impact force over the surface area of the nitirle foam impact core (3) and begins decelerating and dissipating the impact energy (1). 3. NITRILE FOAM IMPACT CORE (3) "unencumbered" inside the expanding pouch (4), utilizes it's intrinsic ability to expand and compress (deformation) to further decelerate and dissipate the impact force (1). 4. EXPANDING POUCH (4) reacting to the physical changes within the nitrile foam impact core (3), expands simultaneously with the core's expansion compression (deformation). 5. 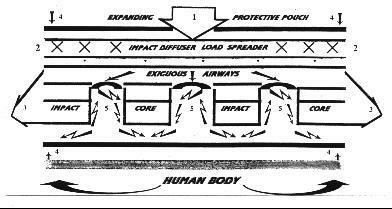 EXIGUOUS AIRWAYS (5) located along the underside of the nitrile foam impact core (3), prolong the duration of impact deceleration by limiting airflow velocity (exhaust) to one direction within the impact core (3) as it beccomes compressed against the body. These minute airways function as "retro rockets" (5), retarding the kinetic compressibility effect on the impact core (3) while effectively reducing harmful levels of impact energy (1). (a) IMPACT owners can replace or upgrade INDIVIDUAL components when they become damaged or obsolete. Because of IMPACT'S unique modular construction, consumers will no longer be forced to continue using defective/older designs, or incur the expense of purchasing a brand new protector! (b) IMPACT owners can intechange and substitute INDIVIDUAL components to fine tune performance characteristics, or adjust Expanding Pouch ergonomics to more closely approximate weather conditions at any given sport venue.